I’m sitting writing this in my in-law’s house in Cork City, up with the family from rural West Cork to do a spot of Christmas shopping and soak up the festive atmosphere. But as always, I’ll be keeping an eye and ear tuned for wildlife while in town. Cities offer a surprising range of opportunities for wildlife watching. I love the fact that, once your tuned in to the rhythm of nature you notice its beat wherever you go, and discover life blossoming in the most unlikely of places. Many of us spend the bulk of our lives in larger towns and cities — but that doesn’t mean we have to forego our connection with the natural world. Largely unnoticed, the epic struggle for survival unfolds all around us, every day. All you have to do to experience it is pay a bit more attention. 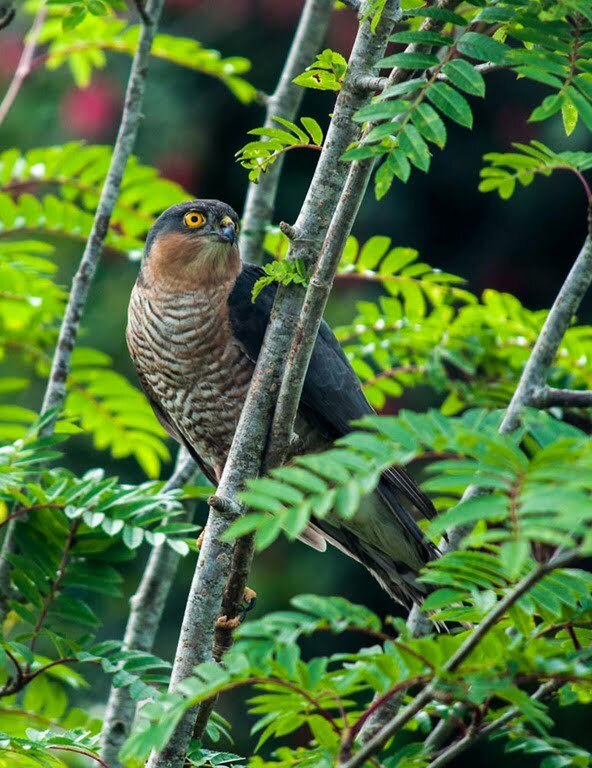 Stunning predators, Sparrowhawks are regular visitors to Irish gardens. Parks, gardens and other relatively undeveloped spaces in our urban environment represent pocket-sized islands of wilderness amidst a sprawl of brick and concrete. These green oases tend to act as wildlife magnets… concentrating a bewildering array of species into comparatively small spaces that are easy to explore. Individual gardens have the potential to become tiny nature reserves in their own right… but when managed with a sensitivity to wildlife, and linked with other gardens in the neighbourhood, their collective value to wildlife is immense. But it’s not just the wildlife that benefits in this equation. Our gardens and urban parks, waterways and roadside verges offer an invaluable connection with the natural world that’s essential to our own well-being. Our busy lives result in an alarming disconnect with the natural world around us, one that research has shown to be far from healthy. Encouraging wildlife into our gardens, and training ourselves to notice the wildlife around us as we go about our daily lives, is by far the easiest way to repair that fundamental connection. I’ve been encouraging people to pay more attention to the wildlife in their own back yard and in the urban jungle for as long as I can remember. When you show people the natural drama unfolding around them they’re amazed; simply paying a bit more attention to the world around you can add a whole new dimension to the daily commute or to stepping outside your own back door. It’s uplifting! Chris Packham, the high-profile presenter of the BBCs popular Springwatch and Autumnwatch wildlife series, appears to share my conviction, exploring these twin themes in his books. First published in 2003 and 2010 respectively, Bloomsbury published new editions of “The Wild Side of Town” and “Back Garden Nature Reserve” earlier this year in association with the UK Wildlife Trusts. In the Wild Side of Town Chris explores the urban jungle, and introduces the various habitats you can find without looking too hard in most built up areas, and the animals and plants that live there. From our houses to urban waterways to roadside verges and city parks, he takes us through each in turn, before focusing on the different types of wildlife found in our towns and cities. There’s even a handy field guide section at the end highlighting key species found in urban environments (NB. the book focuses on British species, and while we share much of our wildlife with Britain, some species — like the tawny owl, grass snake and common shrew, for example — don’t occur on the island of Ireland), and a site guide to Britain’s urban Wildlife Trusts nature reserves. Chris’s enthusiasm for wildlife is, as always, infectious, and coupled with the stunning photography make this a delightful book to read. It serves as a fabulous introduction to wildlife watching in our towns and cities, whether you visit them occasionally (like me) or spend most of your life amidst the hustle and bustle. For most of us — whether we live in town or country, our gardens offer our most intimate and immediate connection with nature. Something as simple as feeding the garden birds can bring us immense joy, and, perhaps more importantly, offers a crucial alternative to burgeoning screen-time that can help our children reconnect with nature that little bit more. Our gardens are an invaluable resource, and while Wild Side of Town focuses on getting people to notice more wildlife in our urban centres, Back Garden Nature Reserve explores ways we can encourage more wildlife into our gardens. It presents a host of projects and ideas to help us do our bit for wildlife on the one bit of the planet where we have absolute control. There is a bit of background on why gardens offer an increasingly important refuge for wildlife today — touching on conservation concerns like changes in farming policy and land use, and other issues — but it doesn’t get bogged down in them. For the most part Chris focuses on practical, no-nonsense advice to help you plan and implement your own garden nature reserve. As he explains in the introduction, this is not so much a book about wildlife gardening in the traditional sense — more a book about embracing the “natural chaos” of the garden ecosystem, helping it on its way and living in harmony with the myriad species that choose to share our little patch. You’ll find it crammed with useful advice and practical projects — from the simple to the more ambitious — that will help turn your garden into a true haven for local wildlife. 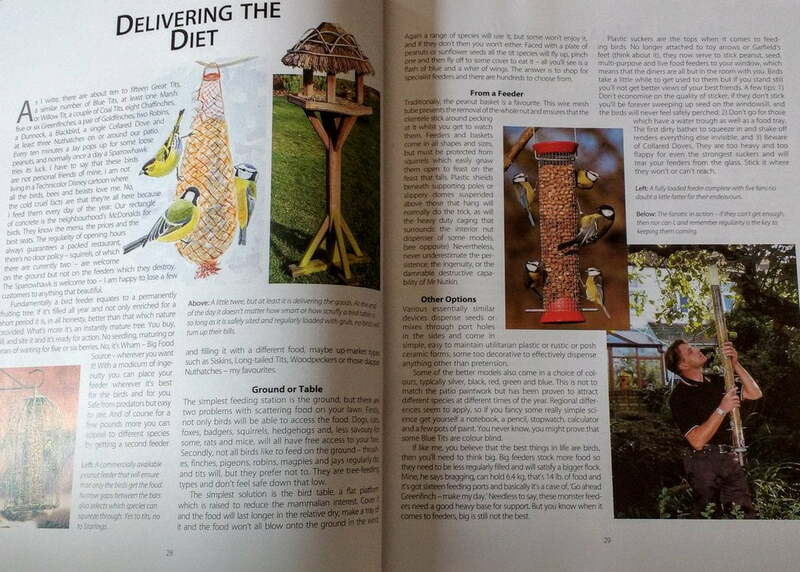 It covers everything from making a pooter to study insects, to building and siting nest boxes, to creating a garden pond. There are even plans for a subterranean badger-stop-over. All of this practical advice is interspersed with a closer look at some of the species you can expect to encounter in your garden nature reserve, and debunks a few unfair myths around garden predators like the red fox, sparrowhawks and magpies. Like the Wild Side of town the book is written in the easy yet authoritative and infectious style that has become Chris Packham’s hallmark as a presenter and author, and it’s illustrated throughout with beautiful photographs and superb illustrations that perfectly complement the text. If you’re interested in seeing more wildlife in our towns and cities, and are keen to transform your own little patch into a haven for nature, then I’d heartily recommend both books. Hats off to Chris and Bloomsbury… they’re very well done. Thanks to Bloomsbury Publishing for submitting these books to Ireland’s Wildlife for review. If you’d like to buy either book you’ll find them on Amazon.co.uk (Wild Side of Town / Back Garden Nature Reserve) or Amazon.com (Wild Side of Town / Back Garden Nature Reserve), or at most good bookshops stocking natural history titles.